LaView's Premium IP Security System for home and business transforms your property into a safe haven that is secure 24/7. 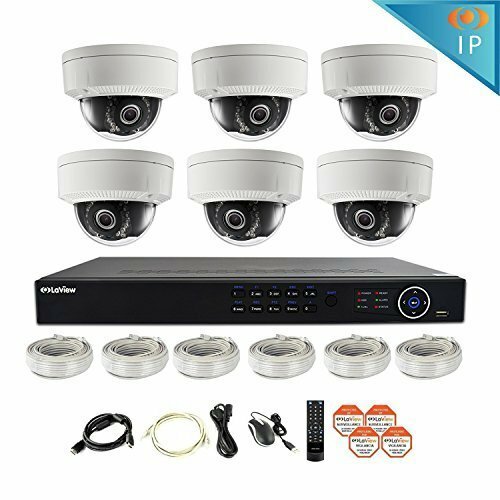 With 6 HD 1080P Dome IP cameras and an 8-channel NVR, the system provides comprehensive coverage that will exceed your security needs.Crystal clear picture quality along with customizable features such as motion detection,Remote viewing via the LaView app keeps you in contact with your property anytime, anywhere. High definition 1080P with 98° angle coverage. Exceptional IR night vision up to 100ft. Easy mounting and installation for any home or business. Weatherproofing makes these cameras suitable for indoor or outdoor use. The 8-channel NVR is equipped with a 2TB surveillance-grade hard drive that covers all your storage needs. Plug and play setup with a single PoE cable per camera for easy installation. This LaView Premium IP system includes 6 1080P 2MP Wired Dome Cameras, Great for Indoor and Outdoor Surveillance. If you have any questions about this product by LaView, contact us by completing and submitting the form below. If you are looking for a specif part number, please include it with your message.